Open daily from 11:30a.m. to 7:00p.m. Admission Free. The closest Metrorail Station is Gallery Place – Chinatown (it is serviced by the Red, Yellow, and Green lines). The Donald W. Reynolds Center for American Art and Portraiture is actually a collection of institutions housed in the Old Patent Office building. These institutions are the National Portrait Gallery, the Smithsonian American Art Museum, the Lunder Conservation Center, and the Luce Foundation Center for American Art. The Old Patent Office building was praised by Walt Whitman as “the noblest of Washington buildings” and is one of the finest examples of Greek Revival architecture in the United States. 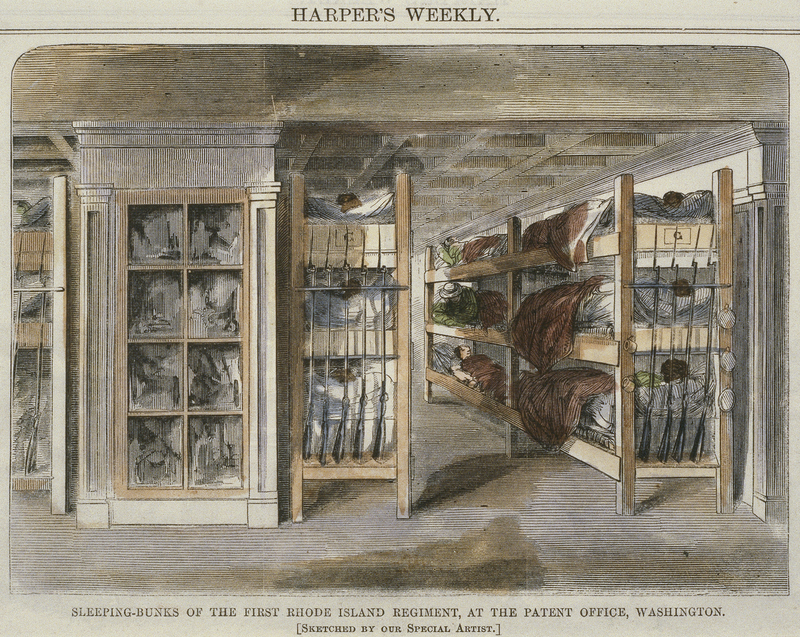 Begun in 1836 and finished in 1868, this “Temple of Invention” was one of the first public buildings in early Washington and was designed the office and repository for the Patent Office. Built on the third major site of Pierre Charles L’Enfant’s famous 1792 plan of Washington (with the first being the Capital and the second being the White House), where he envisioned a “church of the republic”, the Jacksonian Revolution built a temple for a more practical purpose. 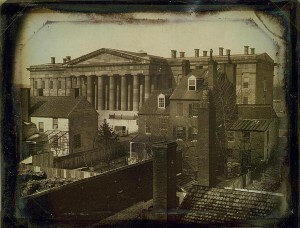 On July 4, 1836, Congress authorized the construction of a “national museum of the arts” and “a general repository of all the inventions and improvements in machinery and manufactures, of which our country can claim the honor.” If you were a visitor to D.C. in the 1850s, the Patent Office Building was a top attraction and inside it one would have seen a hodgepodge of inventions, marvels and curiosities. 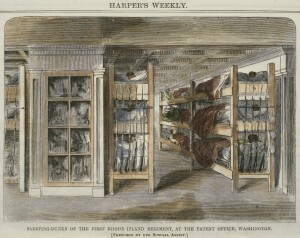 Besides the Patent Models, it was the home to many of the collections that would later become the foundations of the Smithsonian Institute’s museums of natural science, history, and art. Throughout its history, it has been used for a variety of functions: it was a hospital that Whitman visited to read to the injured during the Civil War, it was used for Lincoln’s second inauguration in March 1865, and it was given to the Smithsonian in 1962. Today, the traveler interested in the history of science and technology should proceed directly to the top floor to visit the Great Hall. The Great Hall, as seen today after the recent renovation of the building, was created after a fire in 1877 destroyed the third floor of the building. It was remodeled by Adolf Cluss and and his partner, Paul Schulze. The resulting interior space, originally called the Model Hall, is a dramatic riot of color. Covered in encaustic tile and lit by stained glass windows, the hall celebrates great American scientists. 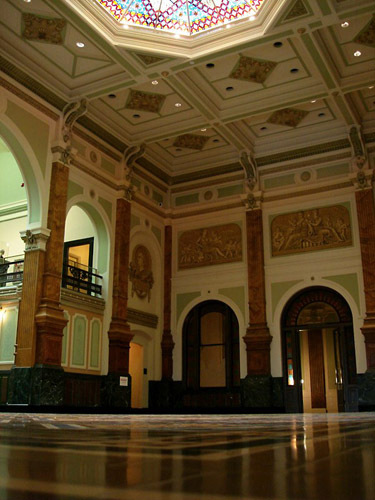 Four of them – Benjamin Franklin, Robert Fulton, Thomas Jefferson, and Eli Whitney – are represented on large medallions in the corners of the Hall. If one has entered the Model Hall from Robert Mills’ graceful double curved cantilevered stone staircases, turning right leads one down the Hall and into more of the Patent Office’s galleries. Today they house the Luce Foundation Center for American Art, but provide the same service – a public study and storage center. The Luce Foundation Center displays more than 3,000 objects and provides interactive kiosks for those interested in the items on display. Additionally, for the weary traveler, free tea and coffee is provided in its small cafe. If one continues through the Luce Foundation Center, one will find the Lunder Conservation Center – the first art conservation center that allows the public full view of conservation staff working to preserve artwork from the collections of both museums. On the way out, I would suggest stopping on the Second Floor landing off of Mills’ stairs to see David Beck’s MVSEVM. The model is designed to show the ‘inside story’ of the building and its history, and contains hundreds of model objects representing the range of materials displayed in the buildings at one time. This intricate sculptural piece is a fascinating interpretation of building’s history into a physical form and is one of the few pieces of artwork I recommended to those interested in the history of science at these two museums. Finally, for those whose interest extends to modern architecture, a stroll through the Robert and Arlene Kogod Courtyard is a must; Conde Nast named it one of the seven architectural wonders of the world. 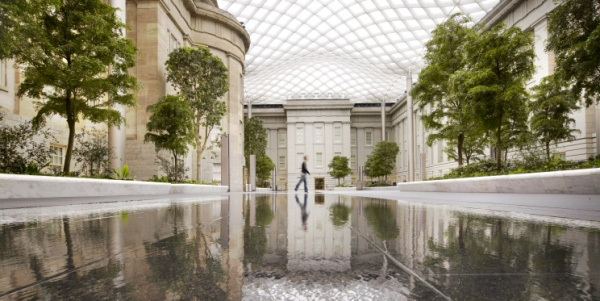 Covered by an elegant glass canopy designed by Sir Norman Foster (note the striking similarity to the British Museum’s new roof), it is a relaxing place to rest one’s museum-weary feet. This entry was posted in North America, United States of America and tagged District of Columbia, museum, Patent Office by Thad Parsons. Bookmark the permalink.